touch the floor at any point but the drop will only be 6"
(or less with shrinkage) at the shortest point. The minimum recommended drop is 10"
You can take advantage of this to hide the legs of foldable tables and others which are unattractive but the average length of drop can make it difficult or uncomfortable for diners. We recommend the use of an 80" Round cloth on 4 foot tables to achieve an even drop and the best diner experience. 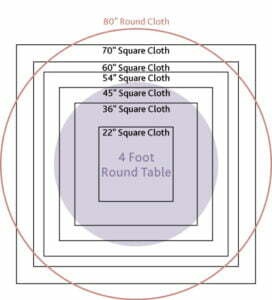 A 90" Round Cloth is the standard size (drops approx. half way to floor). Use a 36" Slip Cloth for a central square. with clear colour contrasts showing in segments. With a 70" x 70" Square Table Cloth the cloth will not touch the floor at any point but the drop will only be 5" (or less with shrinkage) at the shortest point. The minimum recommended drop is 10"
With a 90" x 90" Square Table Cloth the cloth will trail about 6" (15cm) onto the floor in the 4 corners and drop 15" at the shortest point. You can take advantage of this to hide the legs of foldable tables and others which are unattractive but the excess fabric on the floor is a trip hazard and the average length of drop can make it difficult or uncomfortable for diners. 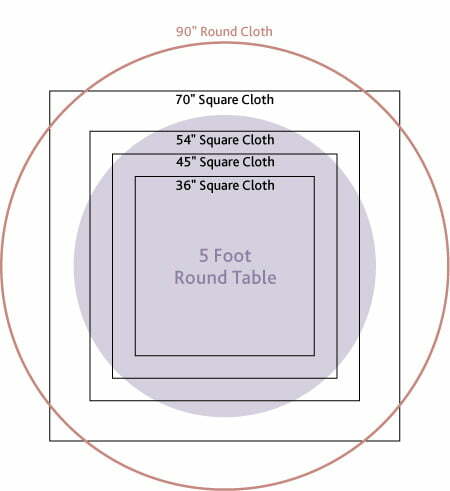 We recommend the use of a 90" Round cloth on 5 foot tables to achieve an even drop. With a 90" x 90" Square the table cloth will drop to the floor in 4 corners and drop just 9" at the shortest point. Take advantage of this to hide the legs of foldable tables and other table legs which are unattractive. A 120" Round Cloth is the recommended size (drops approx. half way to floor). A 108" can be used with only a short drop. A 144" Cloth drops all the way to the floor. Use a 36" or 45" or 54" Slip Cloth for a central square. Use a 60" or Ideally a 70" Slip Cloth to cover most of top with clear colour contrasts showing in segments. Use a 90" x 90" Cloth to completely cover the top but see Tips below. Use a 6.92 Metre Long (by 29.5" drop) Table Skirting. 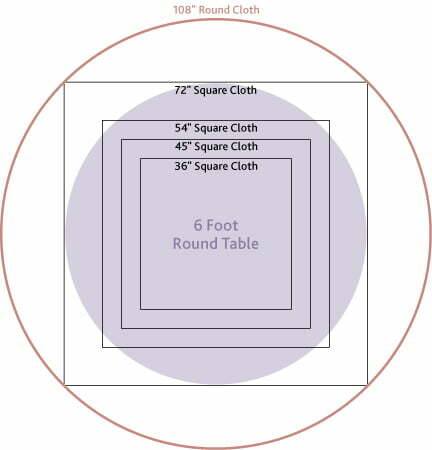 With a 90" x 90" Square the table cloth will not reach the floor in 4 corners but drop just 3" at the shortest point. Allowing for shrinkage (1-2% in PolyCotton 6-8% in Cotton Damask) this is unlikely to cover the table top. A 90" by 90" will cover all but the bottom 6-10" of the legs of table you wish to cover up. Use a 120" Round cloth to achieve an even drop of 12-18" depending on any shrinkage.